In an age of unprecedented skepticism, how can corporate leaders gain the public’s trust? What does it take for managers to become first-rate leaders in today’s turbulent marketplace? How can leaders realistically conquer the most vexing challenges that confront them in our rapidly changing business environment? 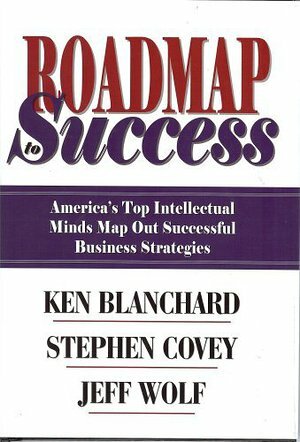 These and other vital questions are examined by three of the nation’s premier business experts in Roadmap to Success: America’s Top Intellectual Minds Map Out Successful Business Strategies. In a unique question-and-answer format, Ken Blanchard (The One Minute Manager), Stephen Covey (The 7 Habits of Highly Effective People) and Jeff Wolf (The Essence of Effective Leadership, to be published in winter 2008) address the major concerns on manager’s and leader’s minds, covering topics that range from the importance of listening and ongoing coaching to true definitions of success and survival in a multigenerational workplace. The book’s premise is straightforward: Without a basic plan or roadmap, leaders will never achieve their maximum potential or success. Business executives must learn to avoid the detours and dead ends that can sidetrack their goals, objectives and careers. Roadmap to Success is a practical tool for plotting your course. The business savvy you’ll gain from the book’s coaching sessions comes from renowned experts who value success as much as you do. If you believe you’ve already reached your career pinnacle, Roadmap to Success will engage your intellectual curiosity and encourage you to strive even higher in today’s business climate. You are your most valuable asset. Are you willing to make a commitment to your success?